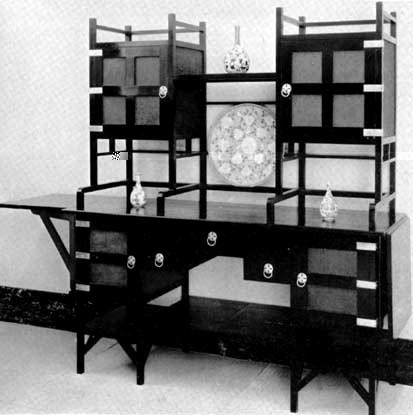 "Ebonised Display Cabinet . . . the superstructure with a pair of panelled cupboard doors, flanking open shelves, the lower half with a drop leaf at either side and one long and two short drawers above a shelf flanked by a pair of cupboard doors, with silver-plated mounts and handles throughout." "Two other versions of this cabinet are known. One cabinet is in the Bristol Art Gallery and the version in the Victoria and Albert Museum (link) is identical save that this example lacks the pressed paper panels. The original design was executed in 1867 although it seems likely that the example in the Victoria and Albert Museum dates from 1877, when it appeared in William Watt's Catalogue. Liberty & Co. began to import the pressed paper from Japan in 1876 and it seems possible therefore that this cabinet predates that in the Victoria and Albert" [Sotheby's catalogue, p. 27]. Important Arts and Crafts Furniture and Works of Art, English, Foreign and European Bronzes I 830- I930. Sale catalogue of 18 May 1975. London: Sotheby's Belgravia, 1975. No. 138.